Last week, I was happy to receive an email about a concert by “Leonhart” to be held last night, celebrating the thirty-fifth birthday of Health in Mind. A Scottish mental health charity promoting positive mental health and wellbeing this charity originally started as the Edinburgh Association for Mental Health in 1982. As agreed, I arrived early in order to capture a variety of images that were requested prior to the concert before taking a seat to await the start. The venue is impressive – St Andrew’s and St George’s West Church situated in Edinburgh’s George Street. For many, this church is associated with the Christian Aid Book Week, an annual event used for helping to raise funds for this worthwhile cause. Shortly before seven o’clock, Andrea Jenson (a dancer performing durig the event) asked me the time. We were running a little behind schedule; not a great concern as it is cold outside. Nonetheless, the lights soon dimmed and we all settled down. 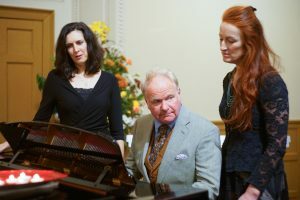 The concert, with composer and musician Leonard Harper Gow playing the piano, began with The Journey; a piano piece accompanied by a narrator telling the story of a young woman’s journey to a successful life; a moving and thoughtful piece. One thing I have learnt about covering events as a photographer – that is wanting to enjoy the event is not always easy when trying to capture the images required. But in this case, with most of the images captured before the main event, I took the opportunity to watch. The performance and the setting were a perfect accompaniement. By the very nature of mental health, it is something that affects as all; but is not as easily recogniseable as a bandage may indicate.